The latest trend to get kids reading comes from the adult playbook: Create a club-like atmosphere, serve up food and let the conversation flow. 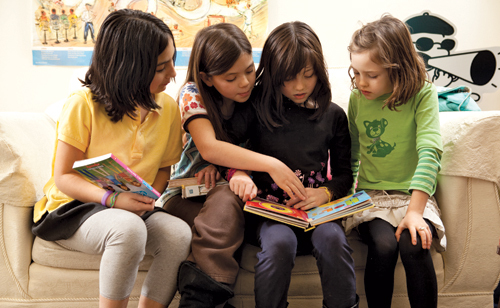 In the past year, bookstores such as Mockingbird Books in Green Lake and Secret Garden Books in Ballard have created book clubs for kids of all ages. “We knew it would be popular,” says Suzanne Perry of Secret Garden, which started a club for ages 13 to 19 and has local superstar young-adult author Liz Gallagher moderate it. The group of about 10 girls and boys meets monthly in a parent-free zone to chat, eat free Snoose Junction pizza and take home a prize in the form of a sneak-peek galley of an upcoming book. (Plus, all customers get a 10 percent discount on the next book club selection.) At Mockingbird Books, longtime bookseller and kid-lit expert Sue Nevins runs several groups for ages 6 to 10 and preteens. Pizza is part of the drill at Mockingbird, too, Nevins says, “since everyone thinks better on a full stomach.” K.V.W.